The habitat in which these trees, shrubs or vines are found. Find and examine two types of animal, insect, or disease damage to trees. In the field notebook you prepared for requirement 1, identify the damage, explain how the damage was caused, and describe the effects of the damage on the trees. Photograph or sketch each example. Our economy in the form of products. Soil protection and increased fertility. Even-aged and uneven-aged management and silvicultural systems associated with each type. The role of prescribed burning and related forest management practices. Visit a managed public or private forest area with its manager or a forester familiar with it. 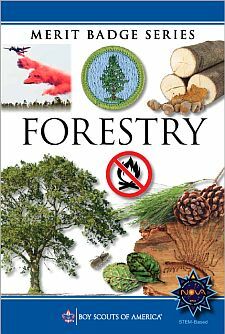 Write a brief report describing the type of forest, the management objectives, and the forestry techniques used to achieve the objectives. The species and size of trees being harvested or used and the location of the harvest area or manufacturer. How the products are made and used. How waste materials from the logging operation or manufacturing plant are disposed of or utilized. In your camp, local recreation area (park or equivalent), or neighborhood, inventory the trees that may be a hazard to structures or people. Make a list by area (campsite, road, trail, street, etc.). Note the species and hazardous condition, and suggest a remedy (removal or trimming). Make your list available to the proper authority or agency. Describe the consequences to forests that result from FIVE of the following elements: wildfire, absence of fire, destructive insects, loss of pollinating insect population, tree diseases, air pollution, overgrazing, deer or other wildlife overpopulation, improper harvest, and urbanization. Explain what can be done to reduce the consequences you discussed in 7a.